In this post, I’m going to discuss what is perhaps the most essential element of an insurgency/counterinsurgency wargame: political mechanics. Most wargames understandably focus on the combat aspect of a conflict. After all, recreating an epic naval battle or demolishing your enemy’s tank formations in a pocket is a lot more interesting than simulating negotiations on a peace treaty or writing a constitution for a new government. All wars are about politics, but simulating the political aspect of a war would not add value to the vast majority of wargames. Insurgency games are some of the few exceptions. Before detailing the political mechanics of the insurgency wargame, I’d first like to talk about a game that mixes politics and war just right. 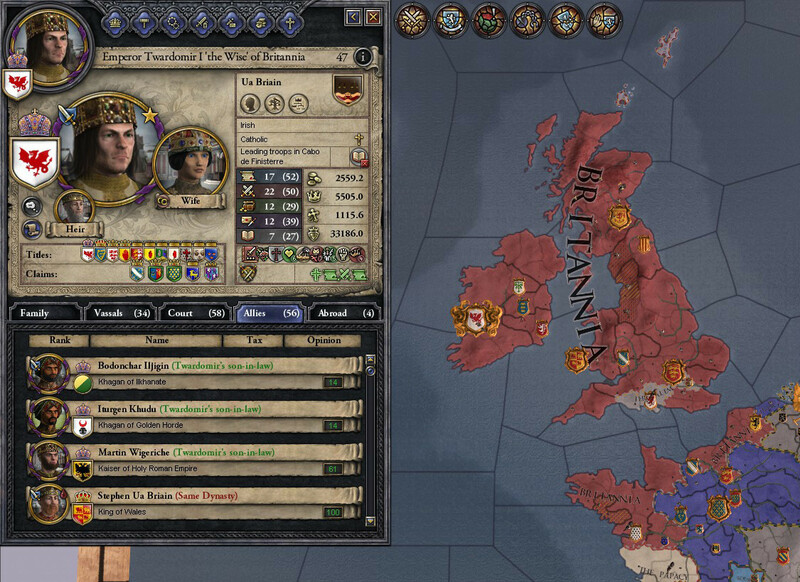 Crusader Kings 2, a medieval grand strategy game by Paradox Interactive, simulates feudal dynasties from 1066 (just before the Norman invasion of England) to the mid-1400s. Unlike Paradox’s other strategy games, and indeed unlike most other grand strategy games in general, Crusader Kings 2 focuses on character-based play. Landed nobles living in a feudal system scheme to usurp each other’s titles, assassinate each other, curry favor with the Pope, carve out a Christian kingdom in the Holy Land, and a wide variety of other era-appropriate activities. Players set their own goals, whether it’s to mend the schism between the Christian churches, get elected as the new Holy Roman Emperor, or simply keep their rivals from amassing too much power. Part of Crusader Kings 2’s appeal is that players have a variety of methods available to achieve a political goal. (For an example, see this post by a Reddit user describing how he managed to get an Irish Catholic to ascend the Byzantine throne without participating in a single battle.) It is often easier to expand through strategic inheritance rather than war, which requires either levies (which make vassals unhappy) or mercenaries (which are expensive). A powerful rival noble that would thump you in a war can be taken down a notch by convincing the Pope to excommunicate him, or you can simply plot with his unhappy courtiers to assassinate him. The simulation of dynasties and extensive family trees adds another layer of possible intrigue; strict inheritance laws mean that you can predict a line of succession and identify possible troublemaking claimants to a title. A screenshot from Crusader Kings 2. By simulating noble dynasties, the game can represent politics in historically-appropriate ways, such as the formation of alliances through marriage. Crusader Kings 2 translates the political and military dimensions of medieval Europe into a system of mechanics that allow for a great deal of experimentation while recreating the constraints and pressures that historical nobles faced. This is quite a feat, keeping in mind that as a commercial product it strives for recreational value rather than historical or simulation value. The tabletop format restricts how detailed the political-military system can be in an insurgency wargame. This is not necessarily a problem, and can in fact be a benefit. Abstracting elements that are not crucial to the simulation (for example, in a wargame about insurgency, you may not be interested in the intricacies of the supply and logistics chain that sustains a military effort) makes the entire system more accessible and easier to balance. To use Crusader Kings 2 as an example again, the balance between Christian and Muslim realms often changes dramatically after an update patch because of the sheer number of variables at play. In the initial release, Andalusian Muslims were more likely than not to overrun the Spanish kingdoms; in the current version, the Reconquista can easily be accomplished more than 200 years ahead of time. It’s easier to design a game that conforms to realistic processes and constraints if it has fewer moving parts. On the other hand, simpler games are at greater risk of having design predetermine their outcome. And with that ramblingly long preamble out of the way, let me finally explain the fairly simple political mechanics of the insurgency wargame. The current Afghan war will be used as an example for illustrative purposes. A variety of resource concepts are abstracted into the basic unit of “political capital.” This represents different things to different factions; thus, for example, the social capital of strong tribal relationships can locally match the effect of the incredible financial capital of a foreign, first world superpower. Political capital (PC) is required for a variety of actions, from training and deploying troops to swaying public opinion to win an election or buy legitimacy. Political capital can be traded between factions as a bargaining chip, though there are some caveats, as not all political capital is equal. PC given by a foreign occupier, such as the US in Afghanistan, represents money, weapons, and advisory assistance that can be universally redistributed and utilized. Other player factions, representing tribal or ethnic factions, are more limited in their political power. A southern Pashtun faction has less influence with a northern Uzbek faction than it does with eastern Pashtuns, which in turn it is less influential with than its own southern Pashtuns. A player faction that actually governs, such as the Government of Afghanistan, has PC with more universal application than local factions, making the goal of holding political power an attractive one. If the government is not popular or is not considered legitimate, its PC is devalued (i.e. more is required to accomplish a task), making it a less attractive bargaining chip. For simplicity, PC is represented through token pieces that match the colors of factions. Thus, a Red player (local tribal faction) that possesses a great deal of White (Government of Afghanistan) political capital has a strong interest in making sure the White player’s government prospers. A Yellow player (local tribal faction) that is being supplied with ample PC from the Black (foreign occupier) player is incentivized to help Black fulfill its political goals, but White has no direct power over him. If Green is capable of generating more than enough of its own PC because of its incredible popularity in a given territory, it has little incentive to accept PC from White or Black—unless it has ambitions to national power beyond its local territory, where its own PC holds little sway. The relationships between factions, their corresponding populations, and their political goals determine player strategies; political capital is the medium through which those elements interact. The most important distinction between player factions is their political goal, as everything else essentially stems from that desired outcome. Players can move toward their goal in a variety of ways, but the relative simplicity of a game compared to the real world means a significant loss of cues and signaling to be interpreted by other parties, especially if each “turn” represents a large period of time. There must also be some degree of representation of the strengths and drawbacks of factions. After all, insurgency/counter-insurgency is not chess—the players are not identical. Insurgents are not as well-organized as government forces, but they are more effective than if they were. Government forces generally have better equipment and training, but have a harder time building support in a contested area. The solution is the focus matrix, which allows players to organizationally orient themselves toward subgroups of the population to facilitate generating more political capital. There are two areas of focus: the faction divide (this represents whatever classification is used to divide the population in the scenario, whether economic class, ethnicity, tribal affiliation, religion, etc.) and the urban/rural divide. Within the two areas of focus, each level represents a collection of efforts including propaganda and outreach, recruitment, patronage, and other activities. Among other things, levels of focus affect a player’s ability to generate political capital from the group in question. Players can spend political capital to attain more levels of focus, going for either a deep focus (building up levels in one or two factions and in either urban or rural focus) or a wide focus (building up levels equally among factions and in both urban and rural options). Deeper focus on one group comes with the drawback of negatively modifying the player’s orientation toward other groups. Territorially-limited groups will find it easy to focus deeply on their own population and build-up type (urban or rural), but a government player without an abundance of political capital will have to choose their focus carefully and make the right agreements with other players. Interesting post, and an interesting notion – you are getting into the nut of a set of ideas that other insurgency games have nibbled around. Some of my games use the idea of Political Support Levels, divided by Political support Points – this is a mixture of the ideas of political capital, as you put it (though it’s not differentiated, for simplicty) and the general health and acceptability of the faction. In “colonial” situations the Authority player has a finite amount of this but expended it to get more resources (from his infinite stock at home) and conduct more operations, representing his exhausting the patience of his home government; while the insurgent gatthered more resources from his increasing popularity and dominance of populations. Something like the focus matrix was a feature of Joe Miranda’s seminal insurgency game Nicaragua, where leader had to choose a platform (Liberal Democracy, Marxism, Oligarchy etc.) that was more or less palatable to different social classes, who were represented in different geographical areas and whose support you needed to woo. Question about including the urban/rural divide: is this because of the difference in communications, infrastructure, access to services and large amounts of people (a more physical approach), or do you feel that urban inhabitants’ ethnicities, tribal affiliations, religious ties, etc. are altered because they have left the coutnryside (or never lived there in the first place) and have a different economic class structure? Interested to see where you’re going with this! I decided to separate the urban/rural divide as a distinct category (in addition to whatever demographic feature is used to divide the population into ‘color’ factions) because I felt it is an especially important and fairly universal feature of human societies throughout time and geography (though that may well be a bias of perception because of my academic focus on the Middle East). All the reasons you mentioned are examples of why a faction would have to take different approaches toward garnering support from a population depending on its density, even if the population otherwise shares the same characteristics (or in simulation terms, if the population shares the same ‘color’). Ibn Khaldun famously wrote of the enduring social conflict between cohesive rural tribes and the decadent, urban dynasties that ruled them in Middle Eastern Islamic societies. Cycles of usurpation occurred like clockwork; desert tribes threw the old decadent dynasty out of power, then slowly became like them over several generations as they became the new urban ruling elite. I was also struck by Thomas Barfield’s description of the ethnic and tribal groups of Afghanistan, in particular the political rivalry between rural and urban Pashtun confederations. Cycles of mullah-driven, rural-based uprisings (the latest being the Taliban movement) are similar to the urban/rural social dynamic described by Ibn Khaldun. The urban/rural divide can technically be represented with population ‘colors.’ For example, if Red represents Pashtuns, then eastern, urban Pashtuns can be distinguished by using the color Pink. Pink and Red would share more affinity with each other than with, say, Green (Uzbeks). I decided not to go this route because (A) I think the urban/rural divide should always be represented (when applicable) instead of having to be consciously injected into a scenario design, and (B) using colors to distinguish several demographic characteristics at once (the one the scenario designer thinks is pertinent + urban/rural) does not seem like it would be intuitive. I plan on having a different visual cue for a hex’s level of urban build-up. Thank you, very well reasoned!